As many of our clients are industry leaders, we recognise that they are exploring cutting-edge technological developments. Pursuing these avenues of research requires the highest level of expertise and knowledge, and C&R regularly provides a multidisciplinary team of scientists to work innovatively and independently on diverse Research and Development (R&D) ventures for our clients. 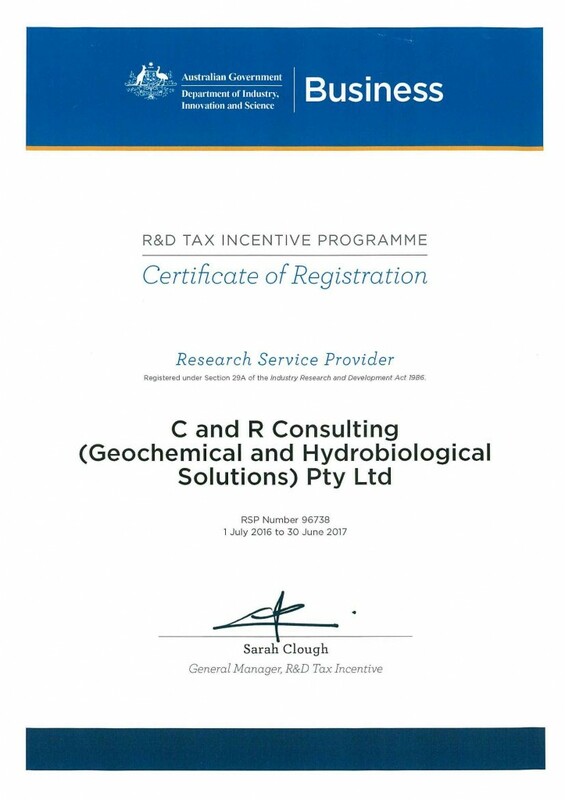 Now our capacity to conduct R&D activities eligible for the ATO’s R&D Tax Incentive is official, with our registration as a Research Service Provider (RSP). To assist Australian businesses in accessing the best providers and equipment, AusIndustry maintains a register of RSPs vetted for staffing, facilities, and ability to provide R&D services. With the registration of C&R as an RSP, AusIndustry recognises that we have the right level of scientific and technical expertise to contribute to R&D projects for our clients. The research categories for which we are certified include a host of environmental and numerical sciences, from physical oceanography to bioremediation and fuzzy logic computation. For more information, please contact us or review our research capabilities.